The retro digital alarm clock brings a bit of nostalgia into your bedroom. The typical vintage old school alarm clock has a round face with 2 bells at the top. Looking elegant on your bedside table, the old style alarm clock is noted for the loud ringing noise of the bells. People love the retro style alarm clock because it reminds them of things past, of happy memories spent with loved ones. The retro style clock is also sought after by vintage clock collectors. I have given out retro alarm clocks as housewarming gifts and the recipients always have nice things to say about their antique looking clock. Besides the bedside table, these alarm clocks with the old style design would fit into your old style decor theme or country side decor theme whether in the bedroom, living room or on the mantelpiece. Small and portable, you can take it along with you when you travel. There’s no reason then to be late for any appointments. I came across some of these lovely nostalgic alarm clocks on Amazon, did some research about them and decided to write down what I found. Some of these retro clocks now come with modern features such as LED backlit face and showing digital time. This old style alarm clock with the bell shaped attachments at the top reminds me of the nostalgic alarm clock on grandma’s bedside table. It used to gave me such a fright every time the alarm went off. 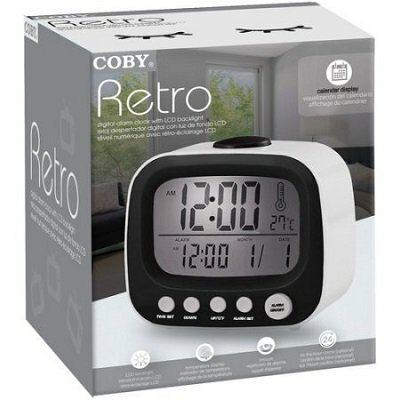 The retro digital alarm clock comes with 4 dimmer settings, with the lowest setting turning of the lit light completely. The white LCD display comes with time, date and room temperature display. You can choose either the buzzer or the radio as your wake-up alarm call in the morning. It comes with gradual wakeup lighting feature. However, do take note that the radio will go off after 30 minutes if you choose that as your alarm setting. The motion night light that resemble the bells on top of the clock can be set on or off with just a wave of the hand. Now that’s neat, not much effort needed to turn on the motion light. This motion night light and snooze feature is really useful and so easily activated. With this retro alarm clock, you get the looks of the old analog alarm clock complete with the 2 bells which are actually LED lights. A digital alarm clock with AM/FM radio receiver feature, this cool retro design clock comes with modern functions such as the digital display. This dual alarm clock comes with 2 alarm settings, one for weekdays and another one for the weekends. You’ll need to plug into a wall socket for it to work but it also comes with battery backup feature. You get a simple quick start guide as well as a more detailed manual. You can get it in black or white color. This lovely wood grain retro digital alarm clock comes with a 9 minute snooze feature. It is a plug-in alarm clock but has battery backup as well for those rare occasions when power stops. Featuring a digital retro flip LCD display, this Jensen AM/FM radio alarm clock comes with calender display as well. This dual alarm clock has the retro timeless flip clock design of the 60’s and 70’s but with modern digital display. It has a clean and compact retro design that sits nicely on your nightstand. The 1″ digital backlit LCD display comes with dimmer control, make it as dim or as bright as you wish. The digital AM/FM tuner makes it easy to tune in to your favorite radio station. It runs on a 120V AC power and comes with a backup space for batteries (The batteries are not included). As for the alarm settings, you can choose to wake up to the beeping alarm sound or the radio instead. With 2 alarms, waking up shouldn’t be a problem. The light on the alarm clock will stay on until you switch it off. You get 90 days warranty offered by the manufacturer. The Jensen retro alarm clock measures 3.2″ H x 5.5″ W x 2.6″ D.
It weighs about 2 pounds. It is made mostly of ABS plastic. The wood look pattern reminds me of the headboard of my bed. It would certainly fit into my bedroom theme. Besides I love retro stuff. This is a cute little clock. It looks exactly like the one I used to have during college days. I really like the LCD backlit as it makes it so easy to read the time in the dark room. This white retro alarm clock comes with alarm as well as 10 minute snooze feature. Its wide 3.5″ screen with LCD backlight makes it easy to read the time, room temperature as well as the month and date. It has a display of the perpetual calendar meaning that the day, month and year can be easily adjusted to be used year after year. You can get it in red, blue, black or white colors to match your bedroom theme. However, the price differs with each color. It has the on-the-hour- chime button but it is optional. You can choose not to set this feature. It measures 4″ H x 8″ L x 3″ W.
It weighs a mere 0.4 pounds. 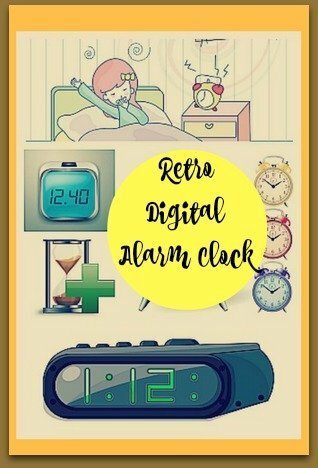 I take great joy in searching for retro digital alarm clocks online. Besides the retro digital alarm clocks, the antique inspired wall clocks look so lovely and elegant too. These clocks certainly make great nostalgic gifts – decorative and useful gifts too.